Once the active treatment is completed, your braces are removed. The next step is called retention. Retainers are utilized to hold your teeth in their new positions until your bone, gums, and muscles adapt to the new positions. You must wear your retainers as instructed, otherwise your teeth may move toward their original positions and the benefit of wearing your braces will be lost. In some cases, permanent retention may be necessary. The retention period is an important part of your overall treatment and should not be neglected! Current recommendation is to wear retainers long term to safeguard treatment results and enjoy beautiful smiles for a lifetime! Remember, wear retainers in your mouth, not in your pocket. 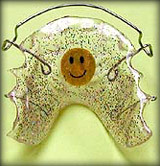 Retainers work when you follow our instructions. Clean your retainers! After meals, clean all parts of the retainer with a toothbrush and a little bit of toothpaste.